SSL Certificates have been in use for almost 15 years, and they continue to serve a vital role in protecting data as it travels across the Internet and other networks. From online financial transactions to e-commerce to product development, SSL Certificates make it possible for users around the world to communicate sensitive information with the confidence that it is safe from malicious hackers. The Internet has evolved in innumerable ways over the past decade and a half; so why do SSL Certificates continue to instill trust? Simply put, SSL Certificates are very effective in protecting data in transit. Yet, customers transacting on websites and systems that are protected by SSL security still face serious threats . One key reason for this danger: poor SSL Certificate management. Enterprises with hundreds of SSL Certificates from several different providers could lose track of certificates in their environment. 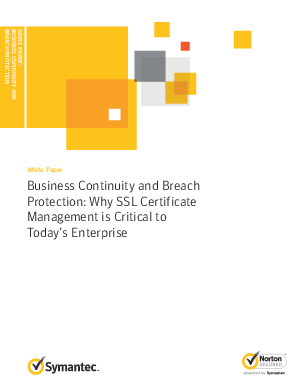 This white paper will present the pitfalls associated with poor SSL Certificate management, why they are potentially dangerous to the enterprise, and how enterprises can keep track of SSL Certificates effectively.